distribution expenses to make trading easy. Misrepresenting Commodity Discs as coins or legal tender is prohibited. 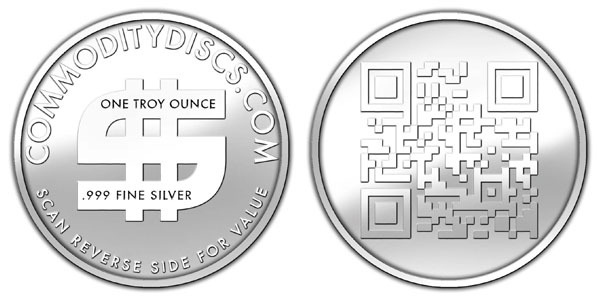 Commodity Discs are intended to be used as a PRIVATE market-driven barter currency, to be traded for goods and services as an ALTERNATIVE to legal tender. To acquire Commodity Discs, or if you would like to accept Commodity Discs as payment, sign your business up to be listed for free on our up and coming Silver Pages Directory by emailing your info to Arlo@CommodityDiscs.com. Learn more, place orders, give feedback and keep up to date on our Facebook Page www.Facebook.com/CommodityDiscs.